Let’s be honest. In the hierarchy of vehicle segment awesomeness, pickup trucks are at the very top. In fact, if there was a spot above the highest possible slot, that is where pickup trucks would be. Pickups have everything you could ever need – utility, power, performance, capability, and the latest in-vehicle tech. Trucks that were once purely designed for work, now feature the same incredible amenities that high-end luxury vehicles include. Whether your truck is bare bones in the amenity department and full-force in the power arena, or vice a versa, doesn’t really matter. As long as your pickup truck is everything you need it to be, you are set for a lifetime of on and off-road happiness. If you are still longing for that perfect pickup, don’t feel left out! You can always come down to DePaula Chevrolet to check out the extensive array of Chevy trucks for sale, and become a part of this incredible club. Regardless of whether you currently drive a pickup, or want to in the near future, the type of truck you drive can say a lot about the type of person you are. Does Your Pickup Reflect Your Personality? Who are you? No, really – who are you? Have you ever sat down to really think about this question, post school days? While many high school teachers and university professors urge self-reflection and improvement, not many adults carry this practice into their lives following graduation. If you haven’t thought about it in a while, take a moment to ask yourself – who am I? Okay, now that you are fully aware of the person you are, let’s take it to the next level. Now, think about the type of pickup truck you drive. Is it a reflection of the type of person you are – or a hindrance? Your truck has the ability to complement your personality, and help you become a better version of yourself. Before you get too down on yourself and run out to buy a new pickup, let’s take a look at the different trucks in the Chevrolet lineup, and what each one says about the person who takes the wheel. 2017 Chevrolet Colorado Base: The smallest truck in the Chevy lineup, the newest Colorado packs more personality and power than a lot of full-size trucks from other brands. After taking a brief hiatus and coming back to the U.S. market with a whole new look, the Colorado is the truck for the person who isn’t ready, or doesn’t need, a full-size pickup. Grabbing the highest fuel economy ratings of any other truck in the bowtie brand’s lineup, the 2017 Colorado gets an EPA-estimated 31 miles per gallon. The base model of the 2017 Colorado comes with everything you need, and nothing you don’t. What it Says About You: If you drive the Base Colorado model, or plan to purchase one in the near future, what does that say about you? What the Colorado lacks in size, it makes up for in lowered up front costs and fuel savings. The base model is less capable than other models in the truck’s lineup, making it the perfect truck for the driver who enjoys the body style, but doesn’t need the high performance specs. Chevy Colorado drivers can be seen as practical, fun, and sporty. 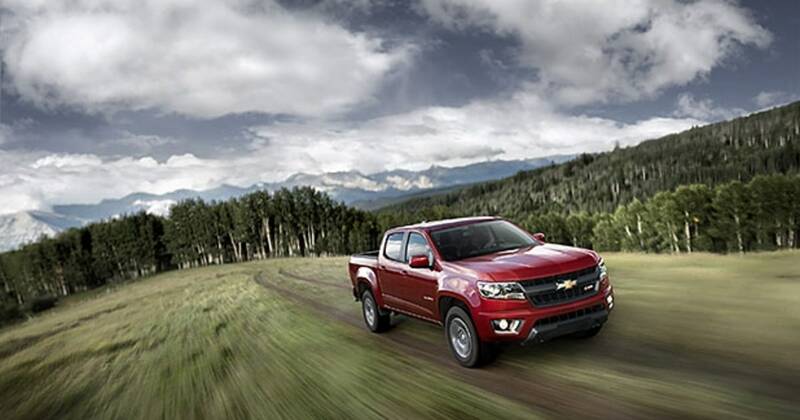 They want the pickup truck without the full-size price, and with a starting MSRP of just $20,055 – that is exactly what the Base Colorado delivers. The full size bed, rear vision camera, traction control, and a 2.5-liter I4 engine are all standard, making it the best truck for someone who doesn’t actually need a truck. 2017 Chevrolet Silverado 1500 LS: The Silverado 1500 is the mid-level pickup in the Chevy lineup when it comes to power and performance. This particular LS model starts at $37,340, which is obviously quite the jump in price from the base Colorado model. This price tag reflects the LS truck with a double cab, four-doors, and a standard size box in the back. This well-equipped truck also happens to feature standard four-wheel drive, whereas the Base Colorado was rear-wheel drive. A 4.3-liter EcoTec3 V6 engine sits underneath the hood, and is paired with a six-speed automatic transmission. This capable pickup can tow up to 7,600 pounds, and manages to get 24 miles per gallon on the highway. Did we mention that this awesome truck delivers 305 lb.-ft. of torque – a best in class rating? As the lowest engine option on the Silverado 1500, it is the perfect level of performance for the price. What it Says About You: If you currently own a Silverado 1500 LS, or are thinking of buying one, what does it say about the type of person you are? Let’s start with the truck body itself. The double cabin means that there is plenty of room for five passengers, which would hint at the fact that while you value your truck’s utility, you also value the importance of bringing friends and family along for the ride. The full-size bed in the back also suggests a commitment to those you love, who are likely calling on you to help move large objects on a semi-regular basis. With your type of personality, you don’t mind helping out; in fact – you enjoy it. You chose to purchase the lowest engine offering in the 2017 Silverado 1500 lineup, which is another glimpse into the practical side of your personality. While the truck did not break the bank, it still offers a few more creature comforts than the standard model. Small extras like a CornerStep rear bumper, a chrome front bumper, deep tinted glass, and power side mirrors, make your everyday excursions a little bit easier to accomplish. On the inside, your passengers are more than comfortable, thanks to the incredible accommodations. With built-in Wi-Fi connectivity, a roomy rear cabin, and optional convenience packages, you and all of your passengers are comfortable on the go. 2017 Chevrolet Silverado 2500HD High Country: This pickup truck is one of the most powerful in the Chevy lineup for 2017. Award winning for power, dependability, and reliability, this is one truck you can’t go wrong with owning. Along with being powerful and award winning, this is one of the most well-appointed pickups in the Chevrolet lineup. Starting at $57,910, this particular High Country version of the Silverado 2500HD comes with four doors and a long box in the back. The massively powerful 6.0-liter V8 engine comes standard with trailering equipment, an integrated trailer brake controller, recovery hooks, and more. This standard engine can tow up to 14,800 pounds – a more than impressive number. Inside, an 8-inch Chevrolet MyLink infotainment screen sits front and center, along with a 4.2-inch driver information display, a Bose premium sound system, a dual zone climate control package, and more. Premium leather bucket seats are also included on the High Country model, making it one of the most luxurious pickups on the road. What it Says About You: If you drive this particular version of the 2017 Silverado 2500HD, it says a lot about the type of person you are. While you value high-performance and capability, you also place an emphasis on in-vehicle comfort and amenities. You enjoy everything that this truck has to offer, from the off-road capability and towing power, to the plush leather seating and high-end interior appointments. You spend a lot of time in your truck, whether it is on the job site, or entertaining clients in the evening – and the Silverado 2500HD High Country is the perfect truck to do both. While the price may be steeper than some of the other trucks in the Chevy lineup, it isn’t the most expensive. This shows that while you enjoy the finer things in life, you are still willing to stay within your budget to get it. If these trucks speak to you, or you want to learn more about what each one has to offer – come down to see us at DePaula Chevrolet. Our knowledgeable team will help you learn more about this versatile truck lineup, and work with you to find one that is the perfect match to your unique personality.